'Set Mundu' (also known as Mundu Set or Mundum Neryathum) is the traditional dress of Hindus in Kerala. 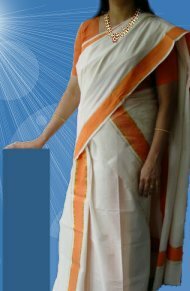 About 50 years back Hindu women in Kerala used to wear 'Rowka' with 'Mundu'. Nair women used to cover Rowka with 'Neryathu'. After that they began to use white 'Melmundu' with Rowka. Later Rowka was replaced by Blouse and Melmundu was replacd by 'Kasavu Neryathu'. For the handloom Munduset, the main makers in Kerala are Chendamangalam, Balaramapuram, Karalkada, Mulloth, Handloom, Hantex, Kasavukada, etc. They have outlets in almost all towns of Kerala. Latest trends in Munduset are Set Sarees, Set Mundu with matching Blouse piece, Munduset with check design, embroidary hand work and block prints. Following are some graphically generated design ideas of set mundu. They are not photographs of any actual garments. KeralaFashion.com is a fashion portal with academic interests in garment styles and trends. We do not produce or sell any textile or fashion products.